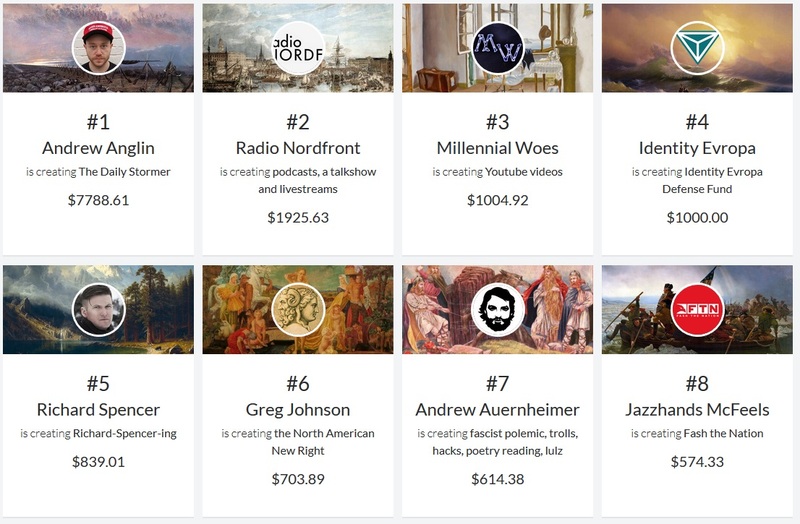 If you want to make a living creating white supremacist content, you’re probably not going to do it via sites like Kickstarter and Patreon, which prohibit hate speech. Fortunately there’s Hatreon, a hate speech crowdfunding site that, despite having been booted from the web by a couple hosts, is back online and eager to let you back your favorite xenophobe. Tucows/OpenSRS has no control or ownership over this domain. We are just the Registrar. We do not host any content or provide bandwidth. a) they aren’t a customer – we work through resellers and b) even presuming we know in advance how someone will use a registration, should we also get to pick which startups we provide registrations to? which political candidates? abortion doctors? NRA activists? That seems to be because technically, their customer was Njalla, which acts as an intermediary between the effective owner of a domain and the registrar. It’s a bit like a shell company for domain names. I agree with Block that it is disingenuous to pretend that Hatreon is not a customer of Tucows — only the thinnest membrane separates them. It’s very much like saying you’re not taking money from a white supremacist because they handed it to someone else to hand to you. Rader’s explanation that (should he be prepared to admit that Hatreon were a customer) they can’t pick and choose who to offer services to holds more water. There don’t appear to be any limits on speech in the Tucows terms of service — not that I could find, anyway. There are plenty of regulations for complying with country code requirements and so on, but no section saying, for example, that Nazi publications aren’t welcome. Njalla, likewise, has prohibitions against “illegal activities” but nothing pertaining to hate speech, harassment, abuse, etc. Update: While Njalla did not initially respond to my requests for comment, founder Peter Sunde Kolmisoppi contacted me shortly ago to say that Hatreon is in fact not welcome on the service, although it was not reflected in the FAQ or terms. The conversation around Hatreon and other sites claiming to provide shelter from what they see as politicized, left-leaning tech platforms is a charged one, and the question of when — specifically — it is appropriate to restrict speech or close off a platform to it is far from settled. But as part of that conversation it’s also important to call a spade a spade: Hatreon’s stated purpose is to empower and protect purveyors of hate speech, and its most popular projects are literally by neo-Nazis. Either a platform allows that, or it doesn’t. When I checked last month, Andrew Anglin, who runs the Daily Stormer, had $7,788.61 coming his way every month. Swedish neo-Nazi organization Nordic Resistance and all-purpose white supremacists Identity Evropa had more than $1,000 per month in backing. Other proud racist individuals like Richard Spencer and Sam Hyde were also receiving hundreds per month to finance their vaguely articulated operations. However, the site at the time warned that “Pledging may only work intermittently while we undergo testing,” though Hatreon confirmed to me that its payout system (it’s unclear what payment processor is being used, though PayPal is an option for payouts) was functioning despite that message. Since then, the site has updated again with a notice that pledging is disabled, and founder Cody Wilson told The New York Times that a “major credit card company” had removed them from their platform. What is this company? The site contained PayPal references; that company told me that both Hatreon and GhostGunner.net, Wilson’s gun-printing site that he used as a proxy for payments, had been banned some time ago. Shopify, also used by GhostGunner, told me they had no indication that Hatreon was using the platform. Update: Cody Wilson contacted TechCrunch to explain that his company, Defense Distributed, does use Shopify as an ecommerce platform for GhostGunner, but not as a payments processor. It follows that Hatreon is not using Shopify but some other payments processor. It was my mistake to conflate the two and make that connection. Despite these technical and financial problems, this is an active funding engine for hate speech — not illegal, and illegal for the government to restrict, but also demonstrably a purpose which some privately run platforms choose not to support. MailChimp, for instance, was alerted to Hatreon’s use of its services, and although the company told me that it doesn’t comment on individual accounts, it also noted that it will take no part in promoting hateful content. That seems clear enough. Cloudflare doesn’t comment on specific customers but is aware of concerns that have been raised over some sites on our network. One clarification: Cloudflare is not the host of any website. Cloudflare is a network that provides performance and security services to more than 7 million domains. Cloudflare terminating any user would not remove their content from the Internet, it would simply make a site slower and more vulnerable to attack. In regards to the Daily Stormer, Cloudflare has been clear that this decision did not set a precedent for the company. That said, Cloudflare will respond to valid court process and work with law enforcement in any investigations. Indeed, Prince did regret in some ways his decision regarding the Daily Stormer, saying that “We didn’t just wake up and make some capricious decision, but we could have and that’s terrifying.” He called for a better process for this kind of thing, and for now that process doesn’t involve Cloudflare ceasing to provide services to sites like Hatreon. Somewhat tangentially, I also contacted Patreon over whether the company would be pursuing some kind of action against Hatreon for what is almost certainly a trademark violation — the company would not confirm or deny it. But one has to imagine that if the hate site were to gain any real traction, a lawsuit or at the very least a cease and desist would not be long in coming. The web is a hostile place in some ways for the likes of Hatreon and the Daily Stormer, but there’s just enough room at the very edges that, with some careful maneuvering, they can still find their way online. There is, after all, great demand for what they offer. Fortunately, these sites and services are still as good as radioactive to the platforms necessary to enable them at scale, because those platforms are often founded on progressive principles and generally decline to do business with Nazis. Hatreon and its ilk were intended to sidestep those platforms and principles, but as you can see, it’s harder than they thought it would be.